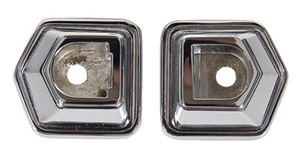 New reproduction of the dash grab bar assist trim bezels for use on 1969 Camaro models. Sold as a pair. These units are OEM quality and not the cheap reproductions also sold out there. Superior reproduction dash grab handle bezels, correct heavy chrome die cast. Pair LH & RH Officially Licensed GM Restoration Parts. For use on 1969 Camaro models.